ROME, Italy - We all knew he had a bright future, and that future is here. Alexander Zverev capped a breakthrough week Sunday, stunning Novak Djokovic to win the Internazionali BNL d’Italia in Rome. He won the biggest title of his career. 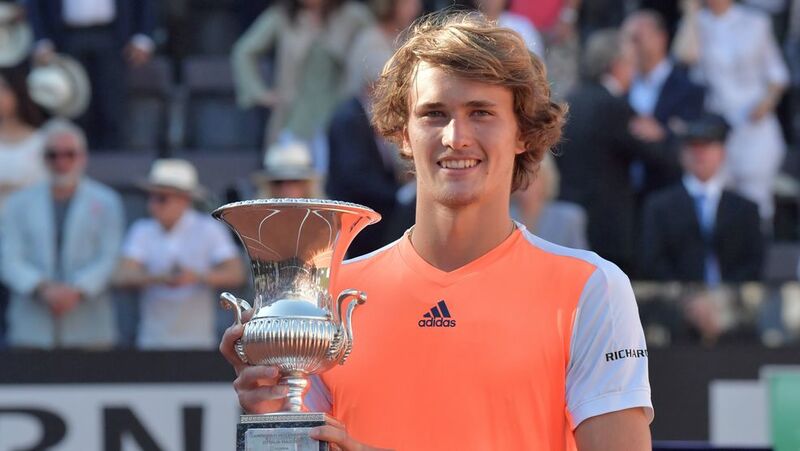 It’s actually by far Zverev’s biggest career title, his first three coming at the ATP World Tour 250 level (St. Petersburg in 2016 and Montpellier and Munich in 2017). His win over Djokovic was the biggest win of his career. Zverev had never beaten a Top 2 player, but he changed all of that with his 6-4 6-3 championship victory over the No.2-ranked Djokovic. He’s the youngest player to win a Masters 1000 title in more than a decade. The 20-year-old Zverev is the youngest to win a Masters 1000 title since a 19-year-old Djokovic won Miami in 2007. He’s actually the first player born in the 1990s to win a Masters 1000 title. He beat the likes of Milos Raonic, Dominic Thiem and many more to the milestone - and Zverev was born in 1997, too. He had never even been past the quarterfinals of a Masters 1000 event before this. He beat Raonic to reach his first Masters 1000 semifinal, then John Isner to reach his first Masters 1000 final. He’s in the Top 10 now. Zverev rises from No.17 to No.10 with this title. He’s the first German to rank in the Top 10 since the week of October 29 to November 4, 2007 (Haas was No.10 that week). He’s also No.4 in the Race To London. Zverev now only trails Rafael Nadal, Roger Federer and Thiem in the year-long race to the ATP World Tour Finals in London, which will be held in November. He stopped Djokovic from re-taking the lead for most career Masters 1000 titles. Djokovic and Nadal are still tied for most career Masters 1000 titles with 30 each. Federer is next with 26. He’s the fourth German to win a Masters 1000 title. Boris Becker, Michael Stich and Haas are the other three - Haas was the last German to win one and that was 16 years ago at Stuttgart in 2001.